(Nanowerk News) Carbon-based nanoparticles could be used to sensitize cancerous tumours to proton radiotherapy and induce more focused destruction of cancer cells, a new study shows. In a study published in EPJ D ("Comparative analysis of the secondary electron yield from carbon nanoparticles and pure water medium"), physicists have now shown that the production of low-energy electrons by radio-sensitizers made of carbon nanostructures hinges on a key physical mechanism referred to as plasmons - collective excitations of so-called valence electrons; a phenomenon already documented in rare metal sensitizers. This reseach was conducted by Alexey Verkhovtsev, affiliated with the MBN Research Center in Frankfurt, Germany and A.F. Ioffe Physical-Technical Institute in St Petersburg, Russia and an international team. Nanoparticle radio-sensitizers are nanoscale compounds, typically composed of rare metals such as coated gold, platinum, or gadolinium. Alternatives sensitizers could be made of carbon-based nanostructures, such as fullerenes or nanotubes, provided they are biocompatible and non-toxic. Previous studies have revealed that gold and platinum nanoparticles produce a large number of electrons via the plasmon excitation mechanism. In the case of a carbon nanoparticle, this phenomenon yields electrons with higher energy than pure metals, thus inducing greater biological damage. In this study, the authors analysed the spectra of secondary electrons emitted from a carbon nanoparticle composed of fullerite, a crystalline form of C60 fullerene, irradiated by an ion beam consisting of fast protons. They quantified the electron yield in a broad kinetic energy range, using several different theoretical and numerical approaches. 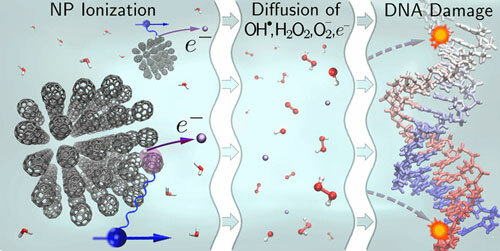 They found that a medium with an embedded carbon nanoparticle results in a number of low-energy electrons several times higher than that emitted by pure water. This may lead to the development of novel types of sensitizers composed of metallic and carbon-based parts.